The only things Alex Rains cares about are rock ’n’ roll, classic cars, and killing vampires—that is, until he meets Carmen, a tough-as-nails cop who's hot on the trail of her missing little sister. When the two join forces, they leave a trail of corpses across the desert as they race against the clock, hunting an ancient evil that’s preyed on the migrants of the American Southwest since the time of the Spanish conquest. While Alex leads Carmen deeper into the deadly, secret world of vampire hunters and their quarry, a romance blooms that neither of them expected. But when it all goes wrong, Alex is forced to make a grueling choice. 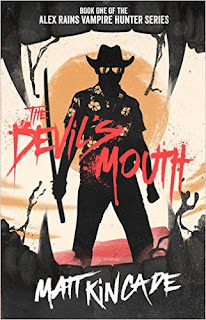 An action-horror thriller from author Matt Kincade, The Devil’s Mouth is an adrenaline-fueled ride through the dark underbelly of America: a warped landscape of old motels, seedy roadhouse bars, and monsters lurking in the night. I'm always a sucker (no pun intended) for a good vampire book and I wasn't disappointed. The main protagonist is called Alex Rains who is a vampire hunter, and whilst tracking a vampire, he stumbles/saves a cop called Carmen, who is trying to find her missing sister. The remainder of the book is spent trying to find her younger sister and along the way they deal with more vampires and their growing relationship. I liked the main character Alex, he was an interesting person who had no special abilities but managed to more than hold his own against the vampires. His personality was quirky and I found him easily likeable. Simply put he's type of person I wouldn't mind hanging out with. The main character, Carmen - the tough female cop - I wasn't so sure on. She said all the right things, did all the right things, but I was still left a bit unsure of her. In terms of the plot, it flowed from one scene to the other seamlessly, and there was a twist in the story near the end that I admittedly did not see coming - it changed the whole dynamics of the book and future books to come. Truth be told I don't think it changed for the better, but that's just my opinion. There is a healthy dash of romance between the two main characters which I thought added little to the plot, but, saying that, near the end - due to the plot twist - their relationship sprouted an extra dimension to it, which does set it up nicely for the sequel. A very well written urban vampire book that fans of the genre will enjoy. There is nothing new here, except for being a very well written story, from a talented author, who I am certainly going to keep an eye out for and very much looking forward to the sequel.